If you have ever seen The Mummy, then you probably remember the scene where Rick O’Connell, played by Brendan Fraser, pulls out his roll of weaponry. If you are anything like me, the first thought that occurred to you was, something to the effect of, “I want one of those.” For this reason, I was compelled to purchase the Big Bag O’ Blasters (or Big B.O.B.) from Blastersmiths UK (BSUK). BSUK is a company, based in the United Kingdom, that offers bespoke Nerf tactical gear as well as upgrade kits and parts for certain Nerf blasters. First, I’d like to apologize for the lack of activity on this blog in the last few weeks. I’m trying to cram as much painting as I can into the few warm days I have left. That said, I have quite the backlog of projects and reviews to share with you when time allows. Here is one such project. A while back I made this LARP Spear for a good friend of mine. Afterwards, he asked me if I might make him a belt-mounted dagger to match. Here is what I came up with. The core is a short length of graphite golf club shaft. The blade is constructed from blue camp pad foam and 1/2″ pipe insulation foam, with an open celled foam tip. The pommel is made of a Nerf ballistic ball, while the guard is made of craft foam. Both have been coated in several layers of Plasti-Dip, and painted. 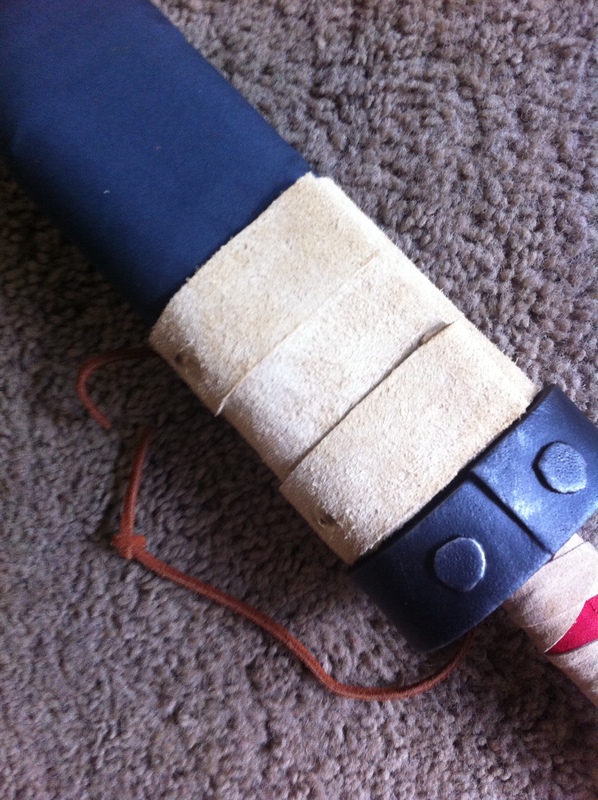 The blade was given a cloth cover, and the hilt was wrapped in hockey tape and leather. The belt sheath is made of leather. 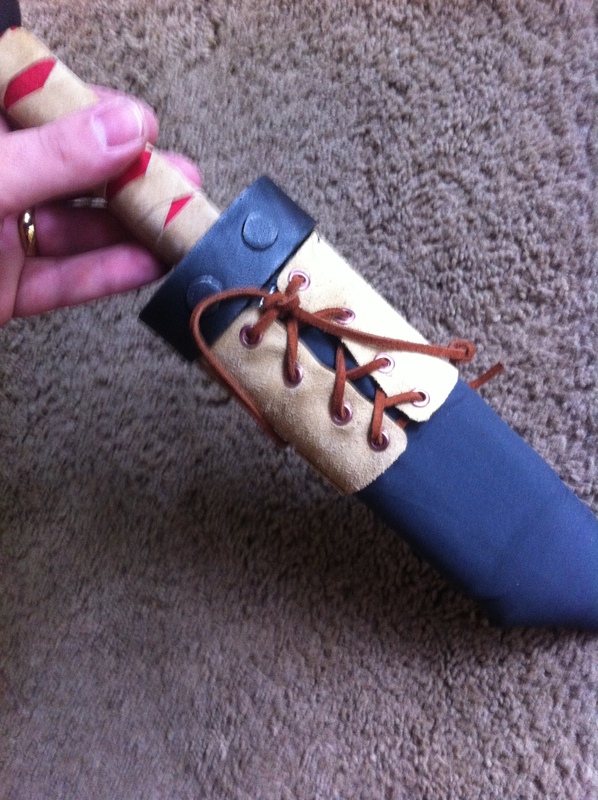 Due to its lack of rigidity, re-sheathing the dagger requires two hands. However, the dagger can be drawn quickly using only one hand. While the dagger is primarily meant for ceremonial purposes, I wanted to insure instant access in case of necessity. The belt loops are riveted to the sheath so that it is worn horizontally at the back. It was designed for a left hand draw, but can be used ambidextrously. I really like the new level of detail that I can put into these weapons using Plasti-dip. I’ll have to think up a really challenging build to test this technique further. Last Saturday was WyvaCon, and it was a blast! 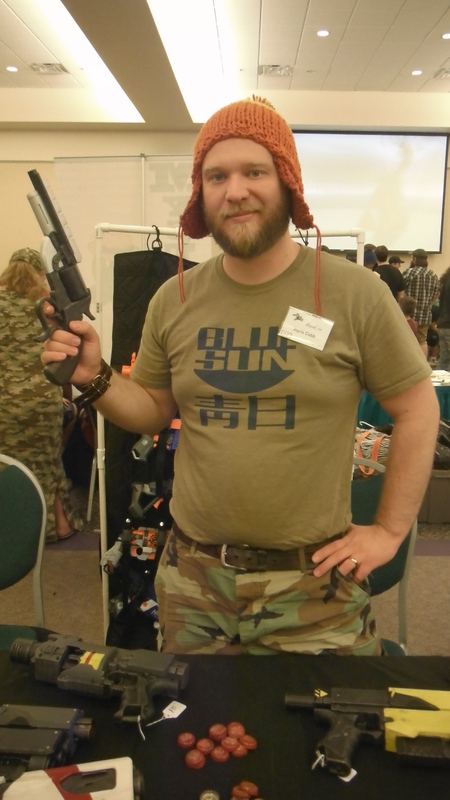 Here I am in my Jayne Cobb (Firefly/Serenity) costume, complete with “Cunning Hat” and Boo. WyvaCon 2015 is this Saturday! I’m fairly confident that I will have everything ready in time, but there is still much to do. I have a scratch made prop gun to finish for my cosplay, a modified Nerf blaster to finish, and a myriad of smaller props to finish sanding and painting. Then there is the remaining logistic stuff. Don’t get me wrong, I’m not complaining. 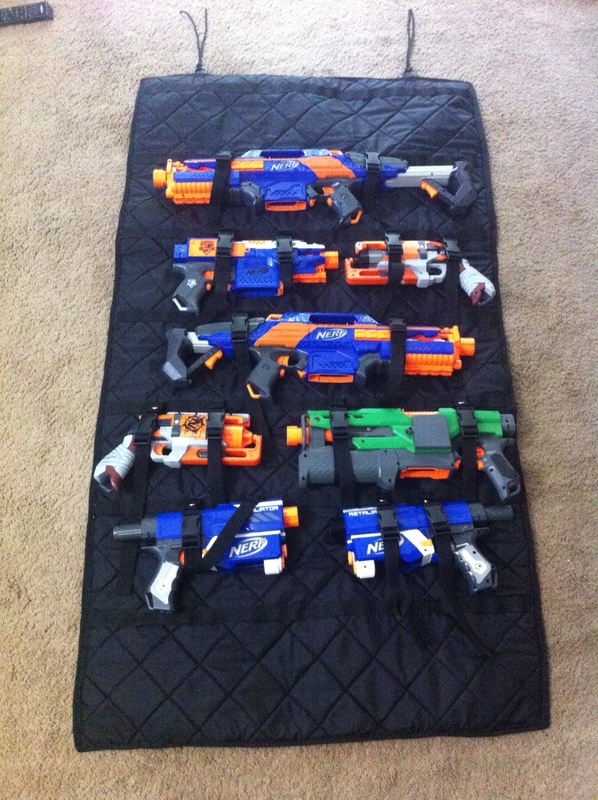 I think i’m most excited about the Nerf Modification Panel that I’ll be hosting. I’m looking forward to meeting some fellow Nerf nerds, and sharing my hobby with the convention attendees. I’ll be taking questions, sharing my own tips and tricks, and doing a few firing demos. Should be a blast. WyvaCon is an annual science fiction, fantasy, and gaming convention. WyvaCon 2015 will be held on Saturday July 25th, at the Wytheville MeetingCenter in Wytheville, VA. Doors open at 9am. Admission is only $5. The convention runs until 11pm that night. For more information check here. If you are a regular reader of this blog, and you can make it to the convention this weekend, I would love to meet you! I’ll be back to my regular post schedule next week. Thanks for reading. It’s been a while since I did a prop post. Let’s do something about that. If you read my blog regularly, then you know that most of the props that I have done in the past were “inspired” by a genre, aesthetic, or fandom. I’ve done steampunk, deiselpunk, and sci-fi props, and I’ve done props that were inspired by Fallout and Borderlands. However, I rarely ever set out to make a specific screen accurate replica prop. There are a few reasons for this, but the primary one is simply functionality. I am often willing to sacrifice prop accuracy in favor of the prop having a function. This is especially true for the things that I make for myself. That is my reason for using Nerf blasters so often. That said, there are times when accuracy is most desirable, and functionality can get in the way. 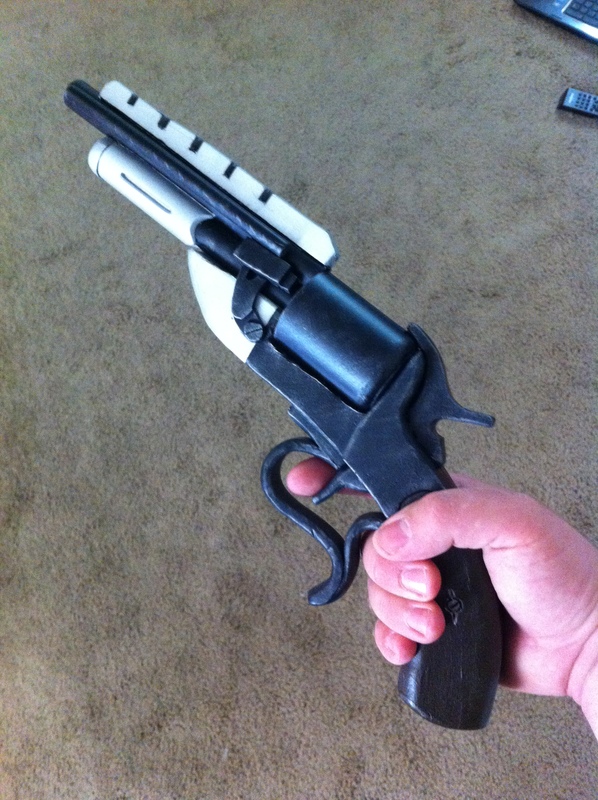 For instance, some conventions are so strict that they will not allow any prop gun that has moving parts. For a while now, I have been toying with the concept of EVA foam props. 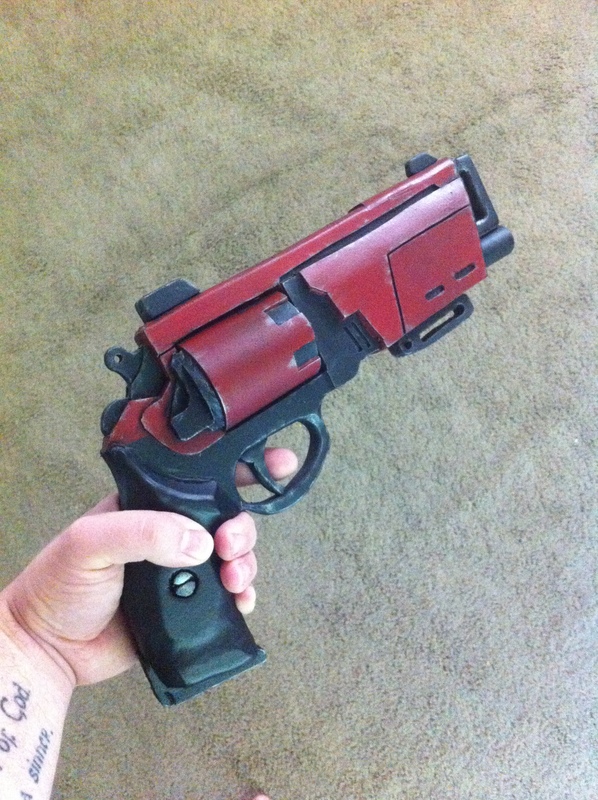 I did a test piece last year that turned out alright, but it was not a complicated prop by any means. A few weeks ago, I decided that it was time for a real challenge, to test my skills. Here is what I came up with. The Duke Mk 44 from the video game Destiny. I originally built this sword in 2007 for my Kurosaki Isshin (Bleach) cosplay. I realize that it isn’t the most accurate recreation of Isshin’s zanpakuto, but in my defense I had access to only one or two reference pictures of Isshin in shinigami form. 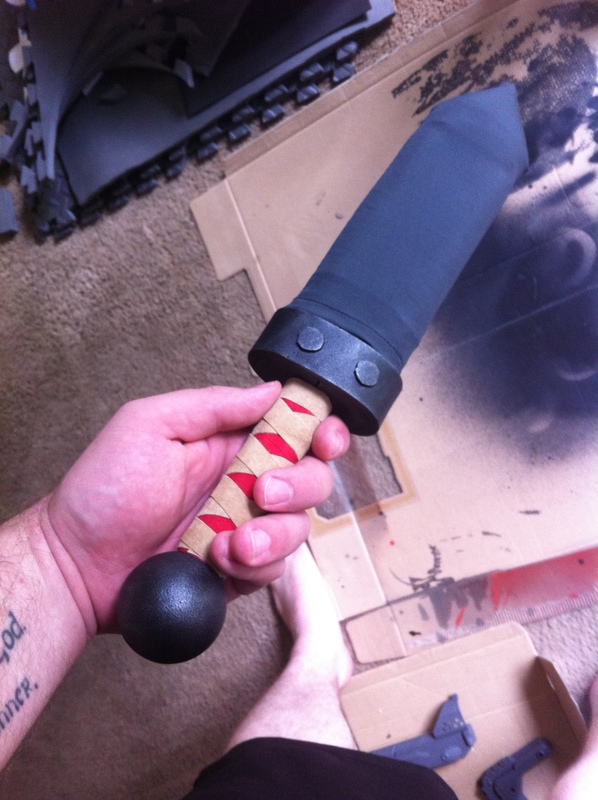 Although intended as a cosplay prop, it was constructed to be a perfectly safe foam combat weapon. After graduating from college, I sold several of my foam weapons. 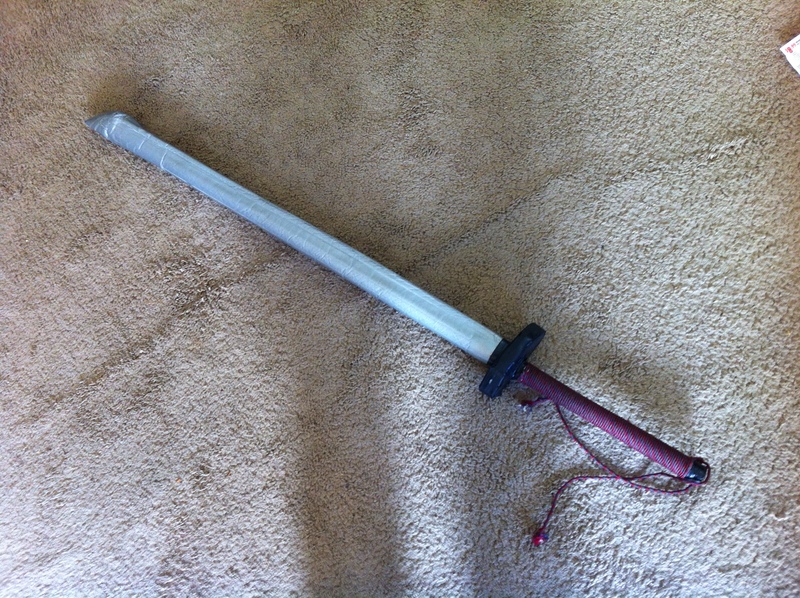 This one went to a friend of mine who subsequently used it in many foam sword battles. After many years of glorious battle, the sword was showing its age. My friend asked me if I would be willing to rebuild it for her.